Compliance leaders utilize Compliance Management Software and Governance, Risk, Compliance (GRC) solutions to simplify compliance with regulatory standards such as HIPAA/HITECH, PCI, and FedRamp. The traditional approach to compliance management and GRC has been to manually assess compliance needs, build administrative policies, spreadsheets, perform risks assessments. These processes can takes many man-hours, and are typically only point in time assessments. The public cloud is being utilized in more and more regulated industries. Over 83% of healthcare organizations using some form of cloud platform. These platforms provide a wide range of cloud services as well as instant scalability and availability. With this transition to cloud, security teams have to deal with managing the regulatory compliance of a wide range of technologies, services, and vendors. Compliance management solutions streamline the process for managing compliance across the organization. The Dash Compliance Automation Platform streamlines regulatory compliance and HIPAA compliance management in the public cloud. 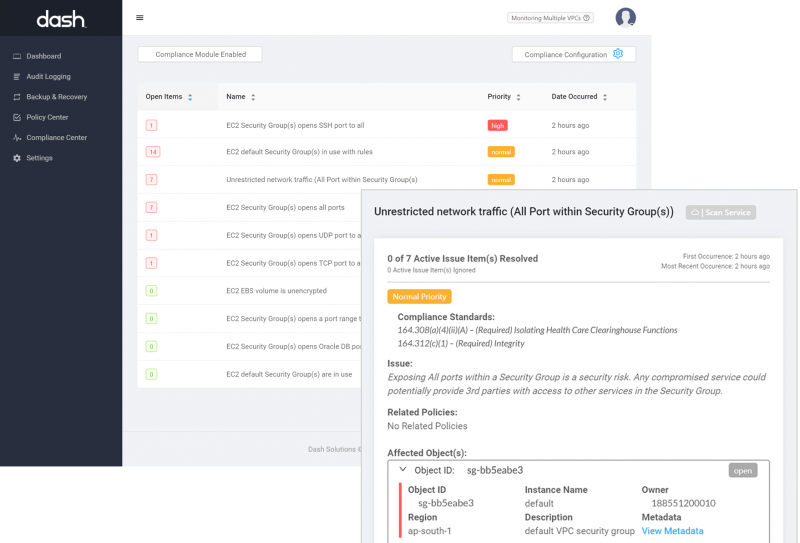 The solution enables organizations to set administrative policies which connect directly to compliance alerts in their infrastructure. Dash Continuous Compliance Monitoring proactively detect HIPAA compliance issues and instantly receive insight into their state of compliance. Healthcare organizations utilize Dash to streamline HIPAA compliance, manage regulatory tasks and lower their overall risk profile. include digital health companies, urgent care facilities, and healthcare providers.